In this angler’s paradise, amid so many wooers, he sought the scarred, rude-featured tarn. Not once, as all do, but again and again; not to try, but to linger. Morning by morning, so long as he stayed there—and he still returned season after season—he climbed, with his long shadow to the westward. And, in the late twilight, his dim form could be hardly made out descending the slope. Sometimes heavy, oftener light, was his basket. Fish are there; not very large, but fairly numerous. Though seldom disturbed, they have moods of their own, and seem specially susceptible to the subtle changes of these rare altitudes. The water, too, is rarer. Heavy or light, each was a record day. The charm was not reckoned by the catch. Heedless was he of the number, in his new-born dream of to-morrow. His was a light sleep, an eager waking. Not the hope of adding to the catch of yesterday gave the bright morning face with which he breasted the hill; nor did the luck of the day turn the head on the pillar of the neck, to look back on the scene he had left behind. Subtle the spell that was working within. He found what was not in St. Mary’s, or was no longer there: that which had left the valley and taken refuge in the hills. He climbed for what he saw, and still more for what he felt. A little creative imagination might have given it to a higher vision. The vague would have taken form, the witchery appeared as the witch of the tarn. The fishing is from the shore. There is no boat—no boat, man has made. Another kind of boat, we shall meet elsewhere. He who would cast far and sure must humour the mountain wind. These winds are fickle, yet, they are the fisher’s ally. The still, hot days are impossible. A moving on the waters is indispensable. I have fished where the ripple ran away from the shore, and followed as the chasing breath changed to another angle. Unlike some tarns, one may walk round with a veering wind, without let or hindrance. Last time I undid my cast and took down my rod, the enthusiast was still fishing. As I crossed the peat hags I looked back to wave him good-bye. I have not seen him since, and will always think of him as on the shores of Loch Skene. Primeval must the trout be that are there. I cannot recall any waterway joining it to sources of fish life below; there may have been when the level was higher, but they are long dry save one. There all ingress is barred. Trout can tumble down if they will, but may not get up. This is the natural outlet known as the tail stream. It has a history past and prospective. Part of the story is already told, and the part which remains may be told with equal certainty. In these southern uplands are dead tarns—dead as the moon. One such is not far from Loch Skene. The dry lips are there of olden shores, which the water kissed I know not how oft, and the mould in which the liquid form lay pulsating to the breath of the mountain breeze. At most a tiny nil, born from the impending watershed, runs through the centre. Once that nil was the tail stream. It bore the surplus from the olden loch. Two processes went on together making for one issue. The still loch was silted up by the waste of hill summits settling on the bed. The restive tail stream fretted its channel. In time the olden loch bled to death. The parched lips, the bleached mould alone tell where and what it was. Loch Skene is slowly bleeding. The tail stream is the operator. It cuts ever deeper in its short and restive course. It surges down, ever more or less stained with its own waste. I have tried to fish; no need is there of wind. The fly dances on the troubled surface, and the bait sweeps whirling for an instant in some strong though tiny maelstrom. Only the nimble among the trout can aim or hold. Then it tumbles out of sight, and must be looked at from below; spreading over the face of almost perpendicular rock, and clinging, as it goes, in a thin white film, so it reappears. No ledges are there where trout may rest for another spring. It curves to the west, as the Moffat burn, to reach the vale beyond, and lose itself in the Annan. 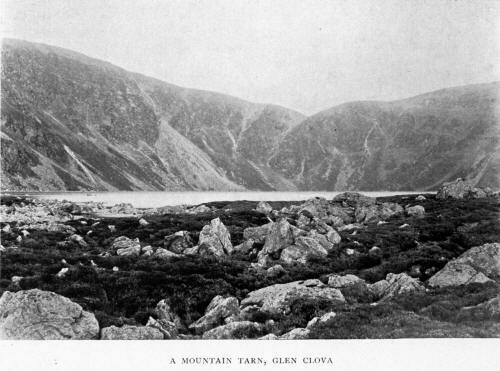 In this filmy spreading fall the tail of Loch Skene becomes the "Grey Mare’s Tail." After heavy rain it changes to the brown mare’s tail. Then, perhaps, it is at its best. Where it lashes its liquid hairs into the stream beneath are fish, small and many; doubtless longing to ascend. Such is the relation of tarn and tail stream. The northern vision is in Forfarshire, away up one of the glens leading into the heart of the Grampians. The sign is where a burn breaks into the stream, just outside the picturesque hamlet of Clova. The rest is but a following up the mountain side. The tail presents no abrupt fall. Nowhere—as in the case of its southern sister— does it cling to almost sheer rock face, nor spread out in the semblance of a grey, changing in times of flood to a brown mare’s tail. It simply tumbles down the rude slope, in a boulder-bristling channel which it has worn for itself, now ruffling into white, now reined for a moment in a dark, fretting pool. The burn mouth is an open door, for the life of the South Esk; as the Sojourners on a highway may turn into a lane. Beyond, is a possible, if a stiff climb. No check is there, no absolute barrier. A rush up the current, a rest in the pool, and so on from stage to stage. I have fished there. It is a boy’s fishing area, compared with the maturer waters, in which it loses itself. Bait and fly are dropped, mainly, in the pools, and the triangular patches of stillness behind the boulders. Whether any of the captures are natives of the burn were hard to say. Trout are found in burns as small, and with no egress save the sea. Where is free passage to roomier deeps, trout are seldom bound. The natives, if such there were, must have been among the smaller and lanker. An occasional large one was on its passage from the Esk. Trout seek upward from wider to narrower waters: it is a habit of theirs. They rather like the blustering current of an incline. In the shallows of the pools, the patient and wily heron stands, gazing down the shimmering surface. Attracted by his scaly legs a trout comes within easy reach: or, half exhausted from its struggle upward against the rush, offers the white of its side as a target for the bayonet-like thrust. Over the slopes on either bank, shepherds come on the wine-stained eggs, with the grape-like blotches of the mountain dotterel. Only shepherds—who, with a patient half-attention, watch their black-faced hill flocks by day—find what is so rare. Here the domain of the water ousel touches on that of his Highland cousin. The one is a bird of the stream, the other of the adjoining drier hill slopes. The dipper rather affects brawling burns, with their endless prattle and gurgle. The main external difference, as every one knows, is that the white lake over the breast of the dipper is drained in the mountain ousel to a silver crescent. The songs differ, very much as the haunts do. The song of the dipper is low, rippling, lively. The stream is lively, and sings a low rippling song. On a slope like this, where the stream is noisy, one cannot help thinking that the dipper pitches his song a little higher. He likes to be heard, and is heard, which he would not be, if he sang as he does to the gentler ripple of a lowland burn. There are dippers of the tail stream. Moor and mountain slope have ever a tinge of melancholy, borrowed it may be from their waste vastness. Moorland birds are affected by this, or express it. Their pipe or whistle has the moor-land melancholy, which they tend to deepen. It may be that the two react, and sounds impress us as melancholy because heard on the moor. The song of the ring ousel is pleasing, with just this tinge. If may be that if heard elsewhere it would be only pleasing. But one likes to hear it at home. It has the restless habit of the dipper. Many moorland birds are restless when disturbed. Witness the wheatear. Near the waterside the dipper’s domed nest is placed, by preference in a vertical hole of a size which it may just fill up. The ring ousel builds in the dry stone heap, or under the perched boulder. The nest in my mind’s eye is amongling—the characteristic northern heath, which reaches to higher altitudes than the purple heather. Through the ling appears the cotton grass, which hangs so many pennants out to be blown of the autumn wind. Probably, the situation is somewhat damp, at least in the winter. And the dry fruit fixes the time as not much earlier than July. An hour or two on either side of midday, there is nothing to tell where the burn may rise. Only mountain rills have a summer habit of running themselves away, leaving but the dry bed. And the large volume, after rainless weeks, raises some speculation. From the arid heights, whose very heather is dusted with the powdery debris of rocks, can so much water come? Straining up the course of the scarce lessening burn—which has no time to play at winding, as its sisters of the plain do—behold the slope ends in a plateau. Three sides are steep hill summits, and in the deep niche, retiring within inaccessible banks, is water in a long, still, half-threatening sheet. Dotting the engirdling slopes are loose stones, which keep slipping down in miniature avalanche. Glittering as they go with the weird sheen of something out of which the hills are built, they vanish with a sullen plunge. I never tried the slopes, but I could imagine that one who did would be in danger of starting an avalanche, of which he would form a part. The same plunge would put out the glitter and the life. And no one would see. Save the golden eagle—which circles there almost any day—as his eye swept across, searching the heather on either side for the blue mountain hare. And the peregrine, in hot chase against the slope; after the grouse, which in its haste and confusion inadvertently struck the water, or with the devil behind, preferred the deep sea. Hard by, the eagle builds. Few seasons is the aerie of the falcon empty. And he who would rob the nest of either deserves all he gets. To the tarn, the burn leads; of the tarn, it is the outlet or tail. The story reads quite simply. The sliding debris of the hills will fill up the lake basin, each avalanche whose weird light goes out in the plunge adding its little. The stream will fret the channel ever deeper. So a day will come—distant it may be, but inevitable—when the moist lips will be dry, and only the stiff mould in which the restless pliant form frets its little hour will be left. This, too, will be a dead tarn. Trout are many but shy. The visitors from the Esk, which freshen the life, soon acquire the habits of those to the manner born. The water is clear; even among mountain tarns, so different from the oft-muddied sheets of the plain. The conditions are rarer, the changes subtler than those of the glen streams. At midday, when the sun beats straight down, when the wind is hushed and the air pants, fishing is impossible. One is fain to rest and watch the afternoon shadows growing on the water. There is a strangeness there also. The sharpness of outline one looks for in the hot dry July air of these upland regions is absent. In its place is the indefiniteness of moister conditions. The tarn has taken possession of the hills, to make them differ from other hills: how, will appear anon. The shadows lengthen over the surface. And with the coming of evening, should a spirit pass, something may happen— that is if the breeze strike not the water too far out. A rise after long casting makes one eager and forgetful. A second makes one oblivious to all save the coming third. With a strike the hills vanish, and all else save the hooked and landed fish. Meantime, the moisture—which has risen invisible in the midday heat to soften the afternoon outlines—comes down in visible chilling mist. The horizon of water creeps in, till no wider than the length of a cast. The slopes around are blotted out, the glen beneath is cut off. The sense of feeling oneself thus trapped for the first time in these rude parts comes back. One were lost, save for the tail stream, whose downward course leads beyond the mist till the valley opens up with its silver thread of Esk. Through the mist comes the light rattle of descending stones, unsettling others by the way, and the sullen plunge of the gathered avalanche. A spell is on those mountain tarns, riven-shored, misty, inscrutable, and the fauna which scream around the hill summit and swim in the still, pure depths. Wilder is the pipe of the wader pattering round the glittering shores; stranger the beat of the wild duck’s wing, which pitches down on the surface. A witchery grimmer than that of lowland lake is theirs. Stranger is this, say, after the first touch of winter; though seen of few save the shepherd, or the shooter, who would have a mountain bird in its winter plumage. The tail stream brawls darker between its snow-sprinkled banks, and the tarn lies chiller under the white summits. The eagle hangs in the still frosty air over the white ptarmigan, and the dark fox Outwits the white hare amid the white snow beneath. While grouse scratch down to the heather tips at once to feed and to hide. The search for the symbol of a presence, the fleeting outline of a form visible to the higher sense, is hard as that for "The Holy Grail." Where our fathers saw visions are none. What was once around the homestead is no longer there. The erst sweet lanes are as an empty house. Without pause, save to glance where the network of shadows imprison the sunbeams, or the mist of blue hyacinth shines in the undergrowth, we pass through the wood-strip. We issue on the pasture where the great steer graze. We turn where the grey ripples break in white on the yellow sand. Many, by the way, say "Lo here, lo there." They be among those who have no true thirst, no aspiration, no sense of other’s want. The chalice cup still hides away from eager eyes and dry lips. The plain left behind, we climb the hills. An uncongenial presence has gone before. Arid are the slopes, the search still vain. A lap of water, as though in the filling of a cup, reaches the ear. A mystic gleam shines, amid engirdling summits, which rain down of their glittering waste. We draw near over the rude approach, skirting the great rocks which rise through the brown heath. The gathering mists play and dissolve, as though some thought were brooding, some meaning about to break forth. A bowl appears resting on its stem, and made golden in the setting sun. Beside is a form, ethereal in its shifting mould. On the shining strand lies craft never launched before. How alluring it all is compared with the empty scenes men call nature! I sail till all is dark.